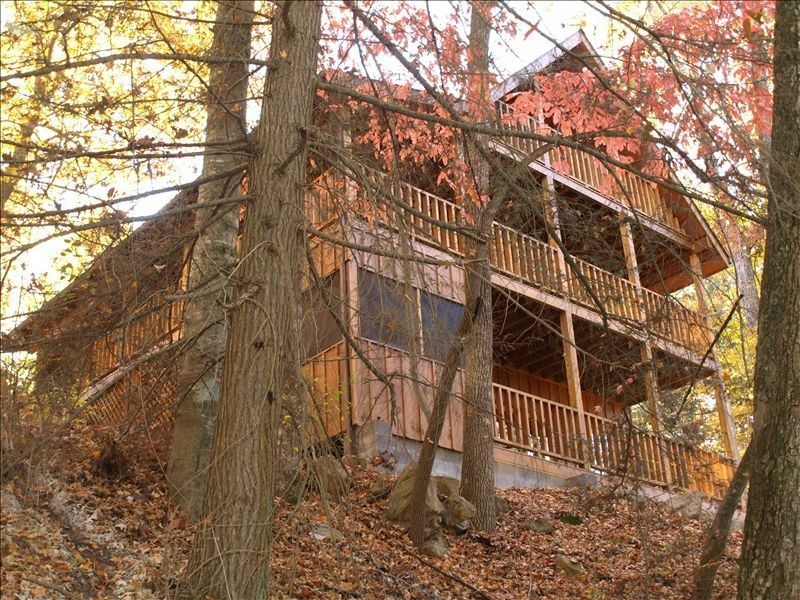 Grin N Bear It is nestled in a private, peaceful and secluded area 2 miles from the heart of Pigeon Forge. Our vacation home/cabin offers 3 KING MASTER bedrooms with master baths attached (one on each of the three levels, cable TV in each room, (2 bedrooms offer) jetted heart shaped Jacuzzi. The peaceful setting surrounds the 3 tier deck for complete privacy. Our hot tub is nestled in a screened porch on the lower deck with absolute privacy. The three levels offer a family room or a sitting area off each bedroom. The game room is on the lower level with a regulation size pool table and family room. Bring your lap top computer and enjoy wireless internet service on the back deck, in your bedroom or on the front porch. Plenty of parking for 4 cars. Wireless Internet Service. Grin N Bear It is tucked into the mountain range and secluded from other cabins yet close to the parkway makes for a wonderful get away. You can stay at the cabin and enjoy the peace and quiet or be on the parkway in minutes for lots of entertainment. We did a little 4 day get away. The cabin was located in a peaceful and good locations. The cabin could have used a little more cleaning, but a good value for the stay. We enjoyed our trip greatly! Everything was amazing. The cabin is really spacious and comfy, the location is great and Peggy gave us all the attention needed before booking. Would book it again next time I travel to that area! Property was clean, comfortable. Well stocked with initial items needed. Plenty of dishes and cook wear. Booking was a pleasant experience. Peggy was easy to work with and responded quickly to any inquiry during booking. Unfortunately, it rained most of the time we were there. Local flooding and high winds. But cabin was sturdy and secure. Wish we could have used the decks for more than storm watching. We stayed in more than we had planned due to the weather, so we cooked more than planned and watched TV. Great place to stay and would return for some good weather. This was our 2nd trip to Grin, and again, nothing was lacking! Loved it. Close to attractions and stores. We loved staying there. The bedrooms were large and comfortable. The tubs were deep and jets work great. Pool table was a gathering area and hot tub outside was nice also. Great staying there and the property owner was very helpful and helped in every way possible. Pet fee: $65/pet Damage Deposit: Either $250 with a personal check or $59 insurance through Cabin ID: 205315 ***PLEASE NOTE: ALL RESERVATION WILL BE CHARGED ADDITIONAL linen fee of $5/nigh/guest t for groups larger than 10 THIS IS NOT REFLECTED ON THE QUOTE OR BOOK IT NOW PRICE.